This is what the Oak building looked like in May. There have been more improvements since; tonight you can see the inside of the place, too. Photo by Wendi Dunlap. It’s been a long wait, with a few bumps on the road, but one more eating and drinking establishment is opening tonight at 8 p.m. on Beacon Hill: The Oak. 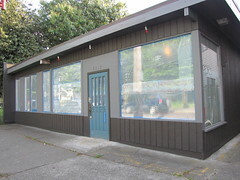 Owner Lisa tells us that the Oak (3019 Beacon Ave. S.) passed its health and fire inspections on Friday and after a weekend of “running around like mad doing last minute things,” the owners decided tonight would be the night. The Oak is the second of two restaurant/bars to open recently after lengthy delays; the Tippe and Drague opened a few weeks ago further south on Beacon Avenue. Finally got to check out Tippe and Drague last week. What a great establishment! Excited to check out the Oak now too! Woo Hoo! So excited to have two great new places to go. Welcome to the neighborhood! YAY! Looking forward to frequenting this place often and become a regular, just like I will be at the Tippe & Drague. Thank you for opening!!! I stopped by tonight after work and I was glad to see the place busy and run into a few friends and neighbors. I really wish this place luck and I look forward to going back. I do however have to mention that I bought two beers the first for 3.25 and the second for 3.50 and both times I handed a Twenty and only received sixteen back each time and both beers were Olympia. I wish them luck but I also hope that they stop skimming off their clients. Is it really worth that extra buck, especially on opening night? Anyone know if they have a web presence? I can’t seem to find one. Guess i could just stop in, but would be nice to know hours, menu, etc ahead of time. I seriously doubt anything like that is going on, JC. I was there last night and the employees and owners were extremely busy behind the bar and in the kitchen. Your not getting the correct change was absolutely an oversight and not at all skimming. These are legitimate, good people who wouldn’t open a business just to fleece people, and certainly not a quarter at a time. That being said, excellent work Oak folks. I’ve been to may opening days and this was one of the smoother ones. Good luck to all and many happy years! Congratulations to The Oak! It was so nice to be in there last night, rubbing elbows with my fellow Beaconites. So excited! We’ll be checking it out asap. Looks great from the outside; can’t wait to see the inside. Good luck to you Oak! I ate here lastnight. Great atmosphere and friendly wait staff. The menu was very limited. I ordered a burger with no may and recieved a overcooked meat patty on a bun with nothing else on it. No tomato or lettuce, etc. She apologized and brought me the fixings. My friend ordered fries, the first ones were cold, but the chef came right out with fresh hot ones. They were delish then. To apologize they brought a great brownie dessert to share. Overall, decent experience and I would return just for the convenience of the location. For some reason I thought it was going to be a kid friendly bar? I liked it, but what we really need is a joint that can accommodate the whole family; just a changing table in the bathroom would be huge plus! Bp, I’ve seen kids eating in there every time I’ve been there (except maybe opening night). There are high chairs and everything. Maybe they will add a changing table in the bathrooms. Hubby and I had dinner there not long after it opened; great to finally have a place to get a burger on the Hill! Had a great experience under the OAK. Loved the burger, and the fries are the best. They had a beer I really liked, and the atmosphere cozy. Love this place! There was a good size crowd when we stopped in on a Wednesday night around 9 p.m. Cozy atmosphere, friendly bartender, good vibe. It was nice to be able to have a conversation without yelling. Glad the Oak is here; we’ll be back!